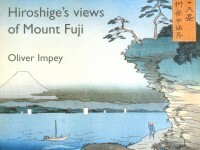 A view-point in the mountains around the Izu peninsula. The falls would certainly have been accessible as sight-seeing place by the 1850s, and this might represent a more-or-less accurate view; the road clearly continues past the fall, as is indicated top right. 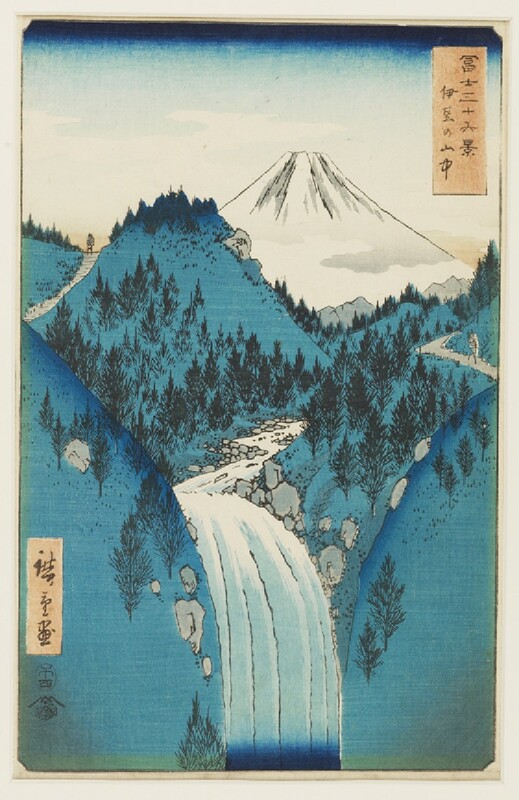 Here Mount Fuji is viewed beyond a waterfall. On the paths to the left and right two lone figures are trudging upwards,carrying heavy loads on their backs. The mountains are printed almost entirely in blue. When brilliantly-coloured ‘Prussian blue’ pigment was first introduced in the 1830s, it was such a novelty that some publishers produced aizuri-e (blue-printed pictures using only shades of blue) for the fascinated public.